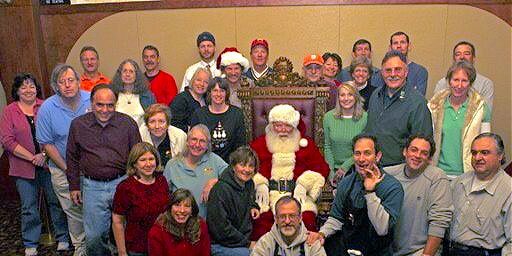 The 2007 "Breakfast with Santa" has just been completed. Congratulations to the Odd Fellows who planned this event, worked hard on Friday night and a good part of today to put it on. I am delighted to report that over 300 children and families attended the 3 seatings today and enjoyed a truly excellent pancake and sausage breakfast, got to meet Santa and received Goodie Bags. It was a near-sell-out, a truly mellow affair. I heard nothing but compliments. And further, we got NINE folks who expressed an interest in joining the Lodge! Special thanks to Lea Rosenberg, Chair of the Community Support Committee, and the hard-working members of that committee, who organized, planned and executed this wonderful community event. I predict that the 2008 Breakfast with Santa tickets will "sell out" well before the event. This event now has a life of its own. What is remarkable is that, by my count, THIRTY-THREE Odd Fellows attended and volunteered today. That's an all-time record. Thank you to: Joe and Leslie Patti, Barbara and John Geisler, Sharla Cheney, Rich Peterson, Dave Reed and Sheryl Cambron, Peter Pascoe, Joyce Puntillo, Jonathan Raven, Lea and Dave Rosenberg, Matt and Holly Bishop, Kathy White (and son), Cass Sylvia, Bob Bockwinkel, Mike Jansen, John Hillis (and daughter), Glenn Mounkes, Bob Schelen, Barbara Langer, Arun Sen, Eleanor Lake, Steve and Robin Souza, Jamus and Julie MacGuire, Tim Carroll, Donna and Jim Provenza, and Rick Gonzales. Also, we thank Roteract who sent several volunteers to help us out. And, of course, we could not have done this without the help of Santa (Don Hatton), Mrs. Claus (Margee Hatton) and the Elves. We had many sponsors and donors of food, gifts, etc., and we raised a lot of money for our charitable recipient of this event: Communicare Health Center. Again, congratulations Davis Lodge Number 169, IOOF. I'm very proud of the members of this Lodge.